Anemos Beach Lounge & La Meduse Hotel is a 4-star hotel located in Perivolos and only a couple of minutes away from the beach. Enjoy the panoramic views offered and and feel comfortable in the luxurious environment that the hotel offers to each guest. If you are looking for a place to relax and also being close to the bars, restaurants and tavernas, Anemos Beach Lounge & La Meduse Hotel is the place to be! 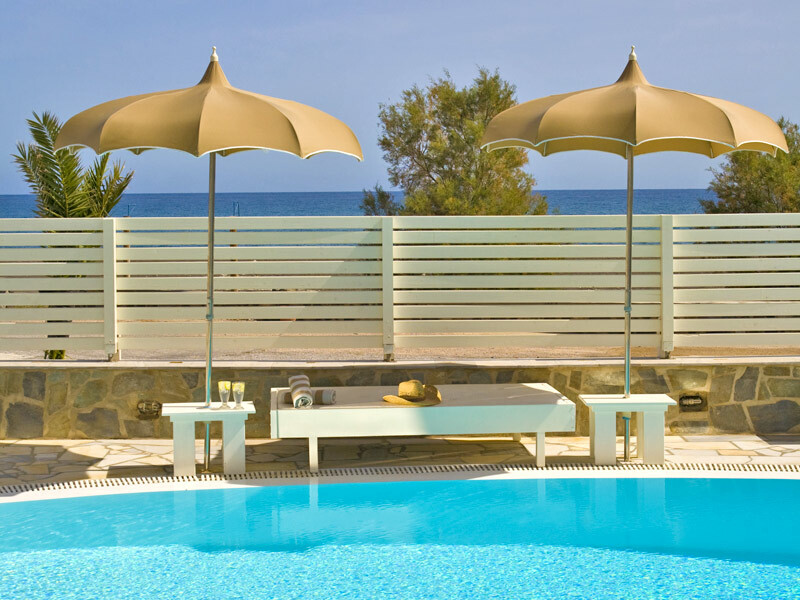 Relax in one of the sun beds, enjoy swimming in the pool and just get a lot of the hospitable sun of Santorini. Garden View Room (1-2 persons): Twin or double bedded room with shower, private balcony or terrace. Sea View Room (1-2 persons): Twin or double bedded room with shower, private balcony or terrace. Superior Side Sea View (1-2 persosn): More spacious twin or double bedded room with small sitting area, bathroom with shower, private balcony or terrace. Superior Sea View (1-2 persons): More spacious twin or double bedded room with small sitting area, bathroom with shower, private balcony or terrace. Executive Garden View (1-2 persons): More spacious twin or double bedded room with small sitting area, bathroom with shower, private balcony or terrace and access to semi private facilities. *Executive Units offer the privacy of their own sunbathing area and a dip pool shared only amongst three Executive Superior Garden View rooms. Private Pool Residence (6 persons): Three separate twin or double bedded rooms with small indoor sitting area and bathrooms with shower. Outdoor sitting area with sun beds, umbrellas and a private swimming pool. All Rooms are equipped with Air-conditioning, direct dial phone, safe deposit boxes, mini bar, hairdryer, satellite TV and guest amenities. Hotel facilities and services: Sun beds and umbrellas on our private part of Perivolos beach, outdoor fresh water pool, pool lounge bar, 24hrs guest relation desk, internet facilities, private parking area, laundry service, maid service, bell boy service, transfers upon request.